In preparation for our trip across the pond, Lady Suzanne and I watched a couple of travel DVDs. We just had to laugh at the overuse of the word “quintessential” in describing British landmarks, traditions, and customs. It turns out that the laugh was on us! Upon arriving in England, it didn't take us long before we caught ourselves using the word to describe what we were seeing and hearing. 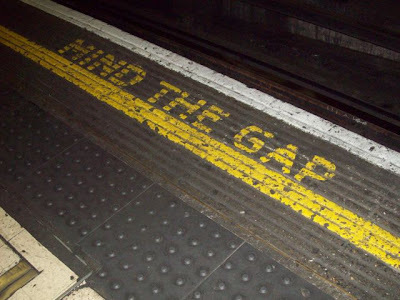 “Mind the gap” is a direction we heard innumerable times in the tube (subway). Basically, it means to watch your step and not fall down the crack between the platform and the train. Though I've always said “watch your step,” I believe the word "mind" is more, well, mindful. I mean, it's one thing to watch and see, it's quite another to be mindful and do. Most everything in England is “lovely.” Lovely means everything thing from very an enjoyable or pleasant event (as in “Oh, what a lovely war.”), sensory quality of something, thank you, or even something that you're completely annoyed about (as in “Lovely, the tube is flooded and I'll have to walk 52 blocks to the hotel!”). All and all, I believe that I will mind my language and use “lovely” more often. 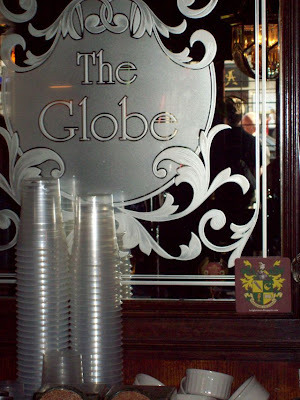 Above is a photo or the first KMSA coaster being displayed in an English pub (our first stop in London). Lovely! Finally, “No worries” (is Mad Magazine's Alfred E. Neuman British?). I love the phrase “No worries” and will bloody well try to use it more often. “Bloody well”? (I'll have to defer to Sir Dayvd on the use of “bloody” in his language). Bloddy hell, look what time it is. Time to get off my arse and sally forth with my day! I hope you found this little blog to be lovely. If not, no worries. 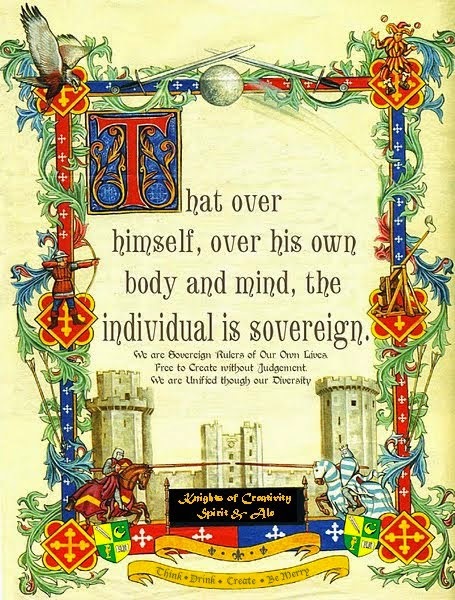 See what I mean....another great Blog by our tallest quietest Knight...lol... Very well observed there bowster.. you have got us pegged. Actally 'Mind the Gap', is a bit of a jonny come lately in the Mind terms, as "Mind Out" or "Mind yourself" has been around as long as people have been bustling and knocking into each other on this tight little island. Also second on the list is the sign that appears in a lot of our Quintessential low ceiling old pubs That Of " Mind your Head", this was usually read just before you bumped your forehead on a low black beam, and spilled the tray of beer. This sign even on occasions appears alongside "Mind the step" a double whammy that makes even the soberest person look like a drunk to the rest of the Pub. crosses the privacy line, but yes, the Subway's automatic voice of "Mind the Gap" intoned as you decant out of the carriage is very English and to be honest i have never seen anyone go down the gap....so i suspect it was introduced in line with American credo of "where there's blame theres a claim", which is taking root over here like a foreign weed. I have to sadly say that "No Worries" is not rooted in England but is itself a foreign import from Australia that has become ours. It came in on the wave of a few Australian TV Soap Operas ( namely "Neighbours" )in the eighties, and took off here because we share the same wish as the Ozzies.. to have an all encompassing phrase to reassure anyone who is demanding something of us. We also use "No problem" too....and hope the person goes away. Talking of Freakin'... the word Bloody has now been demoted from a class A Cuss word to a Class C word....and is used like the american word freakin' or Frickin' To be honest it can only be used correctly and in the right tone and place by a real English person...( just as the N word can only be used by an African American within its group ) It has to be used lightly, with a hint of frustration, but not with malice. The F word is gradually trying to follow the same path thanks to Gordon Ramsey, but a majoritory of Brits are not going to ever let that happen. Lovely and Quintessential. you got those right. Anyway keep em' coming Sir B...i love the british semantics...i'll have to point out some Americanisms to you when i come over. I say 'lovely' and 'no worries' all the time! I didn't realize I was so continental! I don't mind the gap so much, but I might tell you to mind your toes. And my grandma always said, "now, you mind!" so I say that sometimes. I am a quintessential mimic, and tend to pick up accents when I'm around them. 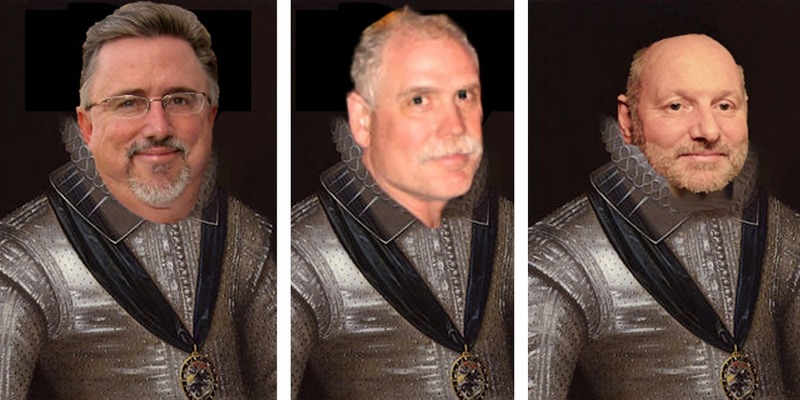 I often worry that folks will think I'm mocking them, which is just not so. A lovely blog, mate! I'm minding the gap in my teeth until Monday, when I get to have it fixed. Thanks to "Lucy" in Stratford Upon Avon!